Tracing — Utility Supply (West) Corp.
Copperhead High Strength Tracer Wire is a premium product for open cut. Copperhead's industry-exclusive CCS reinforced tracer wire combines the strength of fully annealed high carbon steel with the conductivity and corrosion resistance of solid copper. The result: a more cost effective, stronger conductor with superior performance. Copperhead SuperFlex Tracer Wire is for light duty open cut applications. 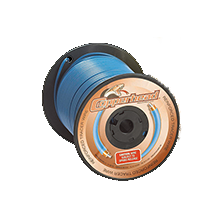 Copperhead's SuperFlex tracer wire features a fully annealed low carbon steel. SuperFlex offers all the field-proven advantages of original Copperhead reinforced tracer wire with the added advantage of flexibility making it the ultimate alternative to solid copper wire. Copperhead's SoloShot Tracer Wire includes several high carbon CCS products offering break load strengths from 1150-4700 lbs. Copperhead's SoloShot tracer wire products are specifically engineered for horizontal directional drilling and pipe bursting. Copperhead's SnakePit Test Station make locating your underground utility easy! The SnakePit offers an insulated direct connection point for your locate transmitter that attaches easily to your tracing wire. Our exclusive encapsulated magnet system makes finding the access point simple. Anti-corrosion technology and a locking cover will give your peace of mind. Secure it, cover it, and don't worry about it. SnakePit's cast iron covers are color-coded according to the American Public Works Association (APWA) standards. What does this mean for you? Instant recognition of the underground utility you are tracing. Copperhead's Cobra T3 Test Station provides convenient above ground access to connect your locating equipment, while protecting your tracer wire. The Cobra T3 can handle up to three terminals plus optional shorting jumpers to give complete flexibility for many field configurations. Copperhead's SnakeBite Locking Connectors make connecting tracer wire easy. SnakeBite's exclusive 90-degree Twist Lock design means you simply insert the wires, twist 90 degrees and the SnakeBite connector is locked. Done! It's that simple! No need to strip the wires! Using SnakeBite connectors reduces installation time and lowers our overall labour costs. Copperhead's DryConn 3-way Direct Bury Lug eliminates the need to cut the main line and installs in less than a minute. This connector is pre-filled with dielectric silicone sealant that never hardens making it waterproof and corrosion proof. The improved outer lid locks down in three places keeping your connection free from contaminants and the user friendly design prevents cuts and handling discomfort. Copperhead's DryConn Direct Bury Twist-on is also offered with or without strain relief which both offer the same water proof and corrosion proof benefits as the Direct Bury Lug by being pre-filled with dielectric silicone sealant. Both Twist-on connectors are one piece for easy installation and work perfectly for splicing lines. The Copperhead ViperMag Pipe and Cable Locator is a general purpose locator used to detect buried pipe and cable services in a variety of situations. The ViperMag has achieved a compact and lightweight design without compromising strength and performance to meet the requirements of those wishing to detect the presence of active power cables, metal locating, and tracing all types of pipes and cables. The ViperMag transmitter can supply a very useful 1 watt signal power. Signal application can be either direct connection or induction if there is no access point. With the addition of the optional signal clamp the ViperMag transmitter can be applied to the target line no matter what the situation. 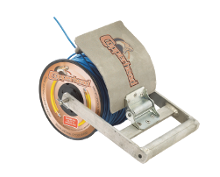 Copperhead Wire Handling Equipment makes your projects easier and save time and money.